In this post, I’m going to share with you a simple and yet profound white light prayer. This is an incredibly versatile prayer that you can use for protection, to raise your vibration, to inspire healing or positive change in your life, and to change your point of attraction in an instant. 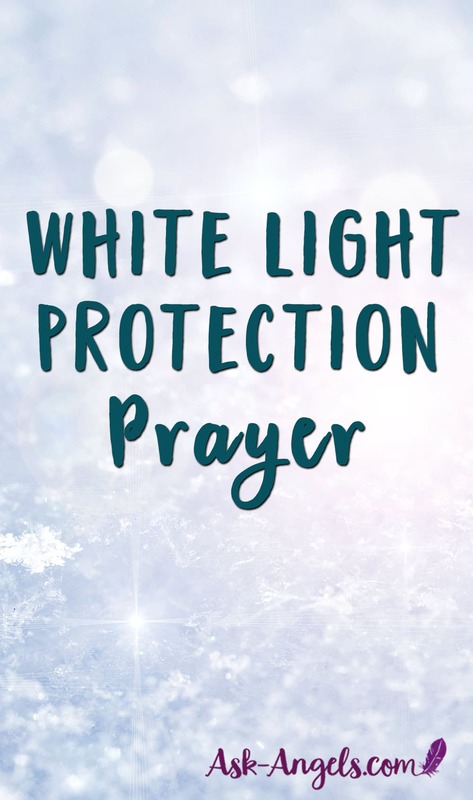 This prayer is not just about speaking words… It’s about invoking, and really feeling the white light of protection all around you. And so, to do this prayer, it just requires your focusing within. You can light a candle or hold a piece of selenite in your hand if you choose, but you don't have to. Just shift your attention inward to the area of your heart center, the center of your multidimensional being, and then begin. Looking for a different Angel Prayer? Click Here! “I now ask to be surrounded by Divine light, with my team of Guides, Angels and Ascended Masters, with the Archangels and Angels who can most support me now. As you speak these words aloud or strongly in your mind, feel the white light entering into your present time and space. Continue to focus your awareness on your heart center. And now, with each in-breath you take, imagine that you’re breathing the white light into your body. Breathe the white light into your mind and as you breathe out, let go of thought, worry or tension. Breathe the white light into your spirit and feel your aura and your light body replenish with this brilliant white light and as you exhale, let go. “I ask that the white light fill and surround me, completely cleansing and purifying my mind, body, and spirit. Protect me, allowing the pure Divine guidance of my Guides, Angels and Archangels to flow through and yet, block out any and all negativity, lower vibrational energy or entities. And then imagine the orb, or circle of white light around you flowing forth. In a powerful burst like expansion, visualize the white light flowing out beyond you, rippling out into your future, into your surroundings, and across the planet. “I ask that the Divine White Light fill my home, raising the vibration and cleansing out any and all negativity. I ask that the Divine White Light clearly illuminate my highest possible path before me. Help me to see the opportunities, to witness the blessings, to experience the miracles, joy and true fulfillment available to me on my path. 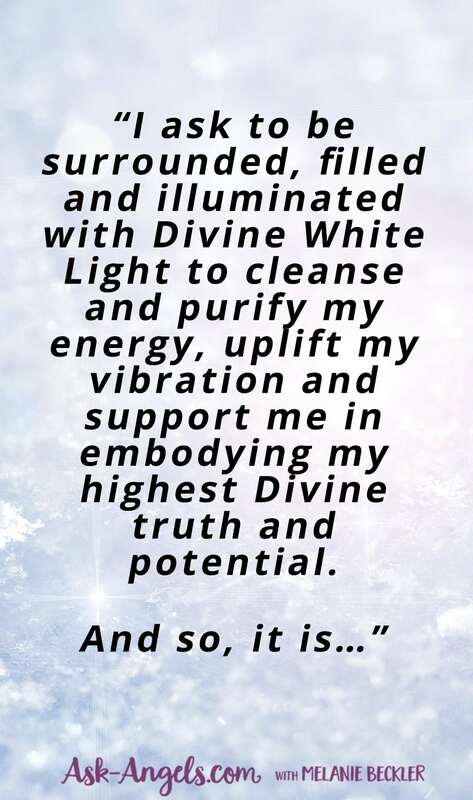 I ask that the white light pave the pathway for me to more fully embody and experience my highest divine self, being the divine embodiment of my higher divine spirit in the physical, according to Divine will, in the highest interest of all. Thank you to my team of Guides and Angels. Thank you to the Divine White Light. The power of this prayer comes not just from reading or even speaking it. Give this bright light prayer a try, and as you do, really feel the light entering into your space as you keep your awareness focused on your heart center. Any prayers you find on this site, including this one are meant for you to use, try, and make your own. Change the words to align the prayer in a way that really works for you… But also remember that while the words are important… Following the light and energy is much more so! Supporting you in more fully embodying your higher divine self and your true authentic spirit. I hope you enjoy this prayer. I truely feel it and Appreciate it. Love I light to you. God will keep blessing you for the extra help you provide every day. This prayer was sent last January, and I still use it, when I’m in the need of protection. I have recently coming to some very bad tidings. It seems that Darkness has overcome. I’m using white light mantras to cleanse myself my home and my family. I have to find the light. I fear I have been cursed. This is not my first run-in with a dark witch. I asked for heaven’s white light to shine down and eliminate so brightly no Darkness can be found. Remember that negativity is no match for focused light! I have been seeing lights in the sky for the last 6 months that look like stars except appearing much brighter. I see them every night as they follow me everywhere I go. They follow all of my exact movements to a tee, for example if I put my arm out and move it from left to right, they move along with me at the exact same time. Can you tell me what all this means and if they are my guardian angels? Sometimes they even appear to me as a disco ball illuminating in different colors that dance around. I am at all times surrounded by these lights as they are in a big circle around me as if they are protecting me. Btw thank you so much for all the beautiful meditation sessions you have shared with the world! I just listened to about 3 of them today for the first time and I felt a tingling sensation throughout my entire body while feeling so relaxed, i’m truly grateful! Thank you for helping me centre again. I had to read it three times and go through the video a few times. That’s how scattered my mind was. Finally I felt the prayer work. I’m reset. Thank you for taking me from the state of I should to the state of presence and gratitude. God bless you. Great prayer. THANK YOU, Melanie. I was asking for the right way to ask spirit how to put what I needed, and this was the first thing I saw. Perfect timing, love what you do Melanie. Thanks so much for this, Melanie. This reminds me to call upon the divine light that is mine to love and use for healing. Hard to remember to do sometimes in this human form! As,allways, just what I needed for today!